My experience in running a Facebook page this year has so far been very rewarding. Seeing people interact with my ice cream posts with super comments and interesting questions is proving both interesting and heartwarming. Such passion for ice cream is great to see! Such is the interest that I feel obliged to give my increasing number of readers more and more ice cream photographs to enjoy. So one of the things I have done is to start building an ice cream sundae gallery. As today is my friend Mary's birthday, here is one of the photographs in celebration of that. Happy Birthday Mary! 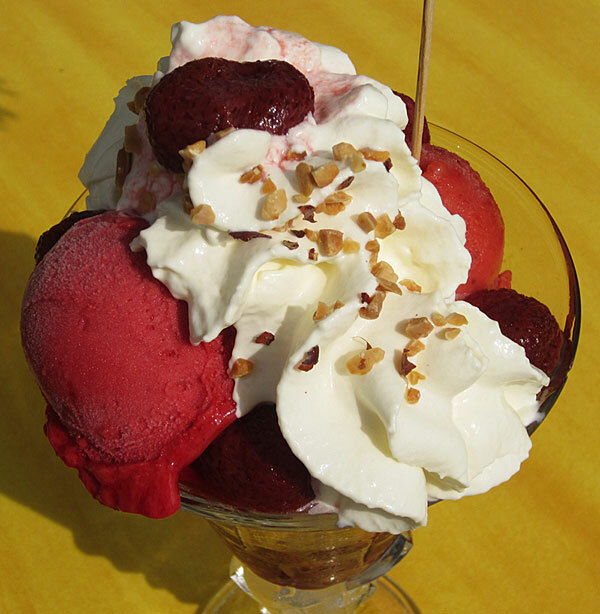 This "Red Fruits Sundae" is just for you. Containing strawberry, raspberry and blackcurrant ice cream with a red fruits coulis and a little frsh red fruit all topped with sumptuous sweet chantilly cream, this is one of the most colourful and appealling ice cream sundaes I have ever seen. I had to be quick with the camera though as my husband and son were only too keen to put it to the test. It didn't last long! To view more just go to my Facebook ice cream gallery.